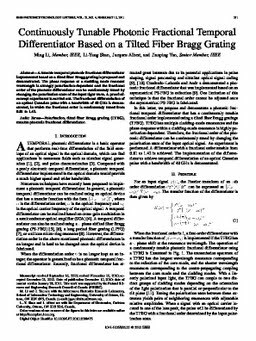 A tunable temporal photonic fractional differentiator implemented based on a tilted fiber Bragg grating is proposed and demonstrated. The phase response at a cladding mode resonant wavelength is strongly polarization-dependent and the fractional order of the photonic differentiator can be continuously tuned by changing the polarization state of the input light wave. A proof-of-concept experiment is carried out. The fractional differentiation of an optical Gaussian pulse with a bandwidth of 40 GHz is demonstrated, in which the fractional order is continuously tuned from 0.81 to 1.42.